Public attitudes towards dentists and dental services determine whether they seek dental care or not and whether they seek preventive or curative dental care. Public attitudes also influence their willingness to accept treatment and the level of anxiety experienced during treatment. Compliance with the health education and self-care practices is also dependent on the public attitude toward dental professional. Ultimately, this information can be used to improve existing services and to plan new ones. A survey conducted in United States of America, reported that 85% of respondents had trust in dentists. Dental visit was considered as important but unpleasant by public in Finland. In Norway, 96% thought that dentists did good work. Data from UK also indicate a steadily improving trend toward positive dental health attitudes. Though a number of studies have been done to assess the oral health status of different population groups in India, there is a scarcity of literature about the public attitude towards dentists and dental services. Involvement of a broader range of individuals in the evaluation of dental health care services is important. Attitude of general public and not just patients is required. An analysis of attitudes towards dental services of the entire community provides valuable insights not ordinarily gained in dental practice. Hence, the present study was undertaken to explore the public attitude toward dentists and dental services in Bangalore city of India. The sample size was approximated to 2000 subjects. Data were collected by administering a closed-ended, structured questionnaire. Inclusion criteria were that the subjects had to be permanent residents of Bangalore city for a period of at least 7 years and aged 15 years or above. Ethical clearance was obtained from the Institutional Ethical Committee. Multistage cluster sampling method was used to draw the sample. Bangalore city is divided into wards for administrative purposes. The list of wards, along with the population in each ward was obtained from the Census of India Report 2001. Twenty clusters of wards based on population size were formed. One ward was randomly selected from each of these 20 clusters to arrive at 20 wards to represent Bangalore city. The sample size for each age group (15-24, 25-34, 35-44, 45-54, 55-64, 65-74, and 75 + years) was proportionate to its size in the population. A sample of 100 subjects across various age groups was further selected from each of the selected 20 wards to reach the sample size of 2000. One street was randomly selected in each ward. A coin was tossed to choose the side of the street to be surveyed. Using the last digits of a randomly selected currency note, the house number from where the survey had to be started was selected. The questionnaire was given to the members of the household who satisfy the inclusion criteria and agree to participate in the study. The survey was continued by going to the next household on the same side of the street. On reaching a cross road, survey was conducted in the cross road on the same side of the street as decided earlier. The procedure was continued until the required sample size was obtained. Feasibility, face validity and content validity were assessed. The questionnaire was previously pilot tested on a small group of people to test the face validity of the questionnaire. Content validity was assessed by an expert in the field of public health dentistry. The necessary modifications were carried out before the questionnaire was finally used for the survey. Since Bangalore is a cosmopolitan city, the questionnaire was also provided in English along with Kannada, the official language of the state. The response was recorded on a 5 point Likert scale. The options given were strongly agree, agree, don't know, disagree and strongly disagree. The percentage of people who agreed and strongly agreed to the statement are represented in % AGREE and the percentage of people who disagree and strongly disagree are represented in % DISAGREE. The data were analyzed using SPSS package, version 10 (SPSS Inc. Chicago, IL). 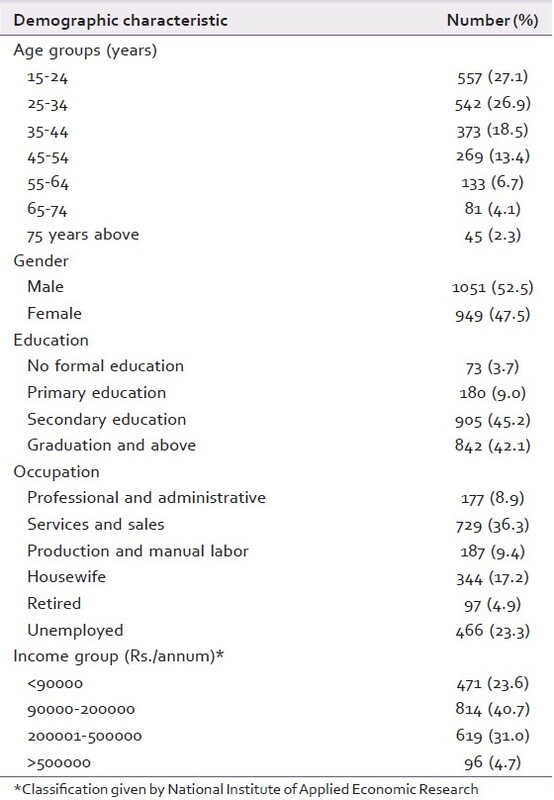 Sociodemographic characteristics of the subjects are shown in the [Table 1]. [Table 2] depicts the dental service utilization pattern of the subjects. About 67.8% of the sample had visited a dentist before; 93.6% of subjects visited a dentist when there was a problem and only 6.4% went for a check-up. When asked for reasons for not having a prior dental visit, 47% of the respondents said that they had no problem. Inability to afford fee was the response of 9.8% subjects; 7.9% of the respondents did not visit a dentist because of time constraints. [Table 3] represents the study subjects' attitude towards dentists and [Table 4] represents the study subjects' attitude toward dental services. Study subjects generally had a positive attitude toward dentists though there were certain areas where the attitude was negative. About 49.5% of the respondents felt that dentist makes them wait for a long time; 54.2% of the respondents felt that dentists' instruments are not clean. Only 57% subjects agree that the dentist help them to give up unhealthy practices like smoking, drinking and pan chewing. Study subjects had positive attitude toward certain aspects like availability of dental services near to their place of residence or work, modern equipments being used for treatment and the nobleness of the dental professionals. However, majority of study subjects feel that dental services are expensive. Only 65% agree that regular check-ups prevent dental diseases. About 33% of the study subjects agree that the dental treatment can be delayed if there are other expenses. The present study was undertaken to explore the public attitude toward dentists and dental services in Bangalore city. The questionnaire had statements regarding dentists and dental services, not the subjects' level of satisfaction with the dental services. In the present study, not just people who have visited a dentist but also those who have not visited a dentist were involved, because it is the view of the entire community that matters. Among those surveyed, 67.8% had visited a dentist at least once whereas 32.2% had never visited a dentist. This trend is similar to the findings of the study conducted by Zhu et al. in China where only 68% of 35-44 years old subjects had made at least one dental visit in their lifetime. The probable reason may be that people in the Indian subcontinent mainly rely on home remedies for ailments before consulting a doctor or a dentist. In the present study, among the subjects who had visited a dentist, 93.6% went to a dentist only when there was a problem and 6.4% went to a dentist for check-up. In a study conducted by Newman and Gift  it was reported that 53% of people in USA regularly visit dentist even when there is no problem. This vast disparity may be attributed to the lack of awareness of the study population regarding the role played by regular dental visits in preventing dental diseases. The presence of dental insurance in USA facilitates the public to visit a dentist regularly. Private dental clinic was the most type of dental service which was utilized by 75.4% of subjects. Similar results were found in the study conducted in Hong Kong  where private dental clinics are the major source of dental care provision. In the present study proximity of the dental service facility to the house or workplace was the most common reason (28.4%) for visiting a dentist. 21.8% of subjects in this study chose their dentist based on recommendation by others. In Finland 34% subjects visited a dentist as recommended by friends and neighbors according to the findings of Alvesalo and Uusi-Heikkilδ. This clearly shows the importance of social environment for choosing of dentist. About 49.5% respondents agreed that "dentist makes patients wait for a long time." Contrasting results were obtained in a study done in UK,  where only 24% respondents agree to a similar statement. This indicates the downbeat attitude of respondents in the present study toward the time scheduling of dentists. In the present study, 70% agree that "dentists need to enquire about general health." Whereas in the study done by Lin et al. in China,  nearly 90% of the subjects agreed that dentists need to enquire about general health. Hence awareness needs to be created in the public about the relation between oral health and general health. About 14.2% of the respondents opined that dentists do not spend enough time to understand the problem. This is comparable to 10% of respondents in US saying that dentist rush through the appointment. Dentists explain the problem and all possible treatment options' according to 67% of the respondents in the present study. This is similar to the findings of the study conducted by Skogedal and Helφe  in Norway where two-third of the respondents felt that dentist explains the treatment plan. In the present study, only 54.2% felt that dentists' instruments are clean. In a study done by Gerbert et al. in USA, an astounding 88% subjects felt that precautions were followed by dentists to keep instruments sterile. Stringent laws in USA regarding infection control practices and the general public awareness of these measures may be the reason for this. The current study shows that 82.8% of subjects had positive attitude toward dentists' skill and knowledge. In a study done by Gerbert et al.,  87% agree that dentists do good work. In another study, 82% subjects agreed that dentists are skilled professionals. This shows a general agreement that dentists are skilled and knowledgeable professionals. About 30% of the respondents feel that dentists are more interested in making money than in the health of the patient. There is a notion that dentist can be ruthless at times as l6.7% of respondents feel that dentists do not treat gently and painlessly; 57% of respondents agree that dentist helps them to give up unhealthy practices like smoking, drinking and pan chewing. This shows that dentists have a major challenge to face when it comes to educating the public about the importance of prevention of oral diseases. Majority of the study subjects (77%) agree that dental care facility is available near their house or work place and only 10.7% disagree to this. Since this study was done in a metropolitan city, public may be aware about various dental care facilities. Treatment area was clean according to 72% of the respondents in this study. This shows the generally prevailing positive attitude toward the cleanliness of treatment area of dental services facilities in Bangalore city. Nearly 70% of the study subjects agree that modern equipments are used for treatment, whereas only 6% disagree. Similarly in a study conducted in Hong Kong,  a vast majority of subjects agreed that modern equipments are used. Dental treatment was considered as expensive by 67% of the respondents in this study. 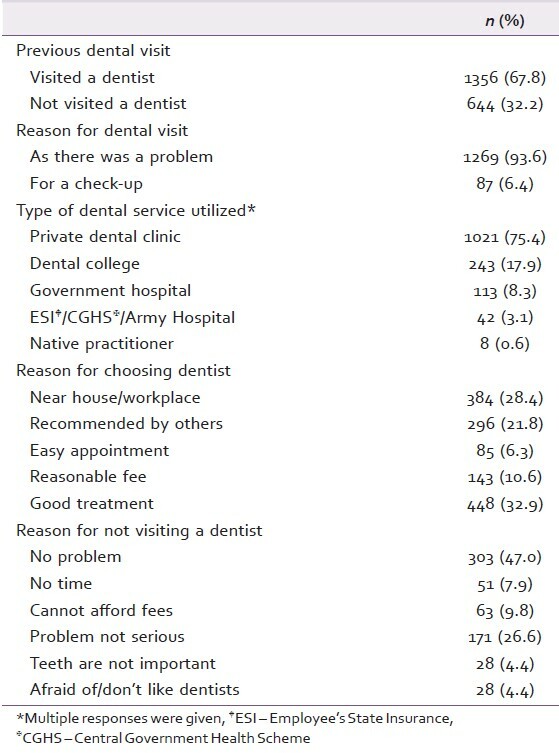 This shows that the respondents in the present study are clearly disappointed about the cost of dental treatment. It may be because patients themselves have to bear the costs of treatment in India. 74% subjects considered dentistry as a noble profession. This shows that the public strongly believes in the nobility of dentistry as a profession. Hence, it becomes all the more essential for dentists to live up to the expectations of public. Most of the respondents (65%) agreed that regular check-ups can prevent dental problems. Even though respondents have a positive attitude towards regular check-ups, only 6% have actually visited a dentist for a check-up. This clearly shows a gap between the positive attitude and the actual behavior when it comes to regular dental visits. About 33% of the subjects agree that dental treatment can be delayed if there are other expenses. This highlights that dental visit features lower down in the list of priorities among the respondents. In this study, 23.4% respondents agreed that dental treatment is not required as teeth will be lost eventually. This negative attitude towards dental services might explain why many subjects have never had a dental visit, and even those who have visited a dentist have done so, only when there was a problem; 39.5% of respondents agree that fear of pain prevents them from utilizing dental services. This negative attitude may be due to the misconception that dental treatment is always painful. The present study is a first step in assessing the public attitude toward the dental profession. The questionnaire used was tested for face validity and content validity, but its reliability was not assessed, which becomes a limitation of the study. Since this is a descriptive study, it only provides overview of public perception. Further analytical studies are needed to analyze factors which lead to formation of positive and negative attitudes of general public towards dental profession. Subjects generally had positive attitude toward dentists. Positive attitude was found regarding availability of dental services near place of residence or work, modern equipments being used for treatment and the nobility of the dental profession. Majority of study subjects considered dental services to be expensive. Negative attitudes were observed regarding waiting time, cleanliness of instruments and dentist helping patients give up unhealthy practices. Dental profession has to take concrete steps to stamp out the unfavorable impressions from the public. 1. Glick M. The expectations of patients. J Am Dent Assoc 2010;141:376-8. 2. Christensen GJ. The credibility of dentists. J Am Dent Assoc 2001;132:1163-5. 3. Rankin JA, Harris MB. Patients' preferences for dentists' behaviors. J Am Dent Assoc 1985;110:323-7. 4. DiMatteo MR, McBride CA, Shugars DA, O'Neil EH. Public attitudes toward dentists: A U.S. household survey. J Am Dent Assoc 1995;126:1563-70. 5. Murtomaa H, Masalin K. Public image of dentists and dental visits in Finland. Community Dent Oral Epidemiol 1982;10:133-6. 6. Skogedal O, Helöe LA. Public opinions on dentists in Norway. Community Dent Oral Epidemiol 1979;7:65-8. 7. Bradnock G, White DA, Nuttall NM, Morris AJ, Treasure ET, Pine CM. Dental attitudes and behaviours in 1998 and implications for the future. Br Dent J 2001;190:228-32. 8. Census Report 2001. Registrar General and Commissioner of Census Operations. Government of India; 2001. 9. Oral Health Status. Karnataka State. Dharwad: SDM College of Dental Sciences and Hospital; 1999-2000. p. 10. 10. de Vaus DA. Surveys in Social Research. 5 th ed. Jaipur: Rawat Publications; 2003. p. 75-7. 11. Lahti S, Tuutti H, Hausen H, Käärlänen R. Patients' expectations of an ideal dentist and their views concerning the dentist they visited: Do the views conform to the expectations and what determines how well they conform? Community Dent Oral Epidemiol 1996;24:240-4. 12. Lahti S, Verkasalo M, Hausen H, Tuutti H. Ideal role behaviours as seen by dentists and patients themselves and by their role partners: Do they differ? Community Dent Oral Epidemiol 1996;24:245-8. 13. Goedhart H, Eijkman MA, ter Horst G. Quality of dental care: The view of regular attenders. Community Dent Oral Epidemiol 1996;24:28-31. 14. Williams SJ, Calnan M. Convergence and divergence: Assessing criteria of consumer satisfaction across general practice, dental and hospital care settings. Soc Sci Med 1991;33:707-16. 15. Bhushan V, Sachdeva DR. An Introduction to Sociology. 34 th ed. Allahabad: Kitab Mahal; 2002. p. 140-6. 16. Zhu L, Petersen PE, Wang HY, Bian JY, Zhang BX. Oral health knowledge, attitudes and behaviour of adults in China. Int Dent J 2005;55:231-41. 17. Newman JF, Gift HC. Regular pattern of preventive dental services - A measure of access. Soc Sci Med 1992;35:997-1001. 18. Lo EC, Schwarz E. Determinants for dental visit behavior among Hong Kong Chinese in a longitudinal study. J Public Health Dent 1998;58:220-7. 19. Alvesalo I, Uusi-Heikkilä Y. Use of services, care-seeking behavior and satisfaction among university dental clinic patients in Finland. Community Dent Oral Epidemiol 1984;12:297-302. 20. Lin HC, Wong MC, Wang ZJ, Lo EC. Oral health knowledge, attitudes, and practices of Chinese adults. J Dent Res 2001;80:1466-70. 21. Meskin LH. Patients first and always. J Am Dent Assoc 1997;128:138, 140. 22. Gerbert B, Bleecker T, Saub E. Dentists and the patients who love them: Professional and patient views of dentistry. J Am Dent Assoc 1994;125:264-72. 23. Lo EC, Schwarz E. Attitudes toward dentists and the dental care system among the middle-aged and the elderly in Hong Kong. Community Dent Oral Epidemiol 1994;22:369-73.